A five-kilogram average daily haul of lobster earns a windfall for divers in one of the most impoverished regions of the Americas, so many take risks, and many suffer for it. Saul Ronaldo Atiliano was diving for lobster in the clear waters off Honduras's Caribbean coast when he felt a pressure, a pain in his body. And he knew he'd gotten the sickness that has killed or disabled so many of his Miskito comrades. "The pressure attacked me deep in the water," said Atiliano, a 45-year-old member of the Miskito ethnic group who for 25 years has dived for lobster, most of which winds up is exported to the United States. Thousands of men across the Mosquitia region of Honduras and Nicaragua depend on lobster fishing to eke out a living. And like Atiliano, hundreds have been stricken with the bends — decompression sickness caused when nitrogen bubbles form in divers' bodies. Some are paralyzed. Some are killed. With more than 60 per cent of its nine million people living in poverty, Honduras is one of the poorest countries in Latin America, and the Mosquitia, in the country's far east, is one of the most impoverished areas. Safe standard diving techniques call for a gradual ascent to the surface to eliminate the nitrogen that the body's tissues absorb during a dive, and for a limit to the number of dives a person makes in a day. Just how many have been stricken is somewhat unclear, though all agree it's a large number for such small communities. 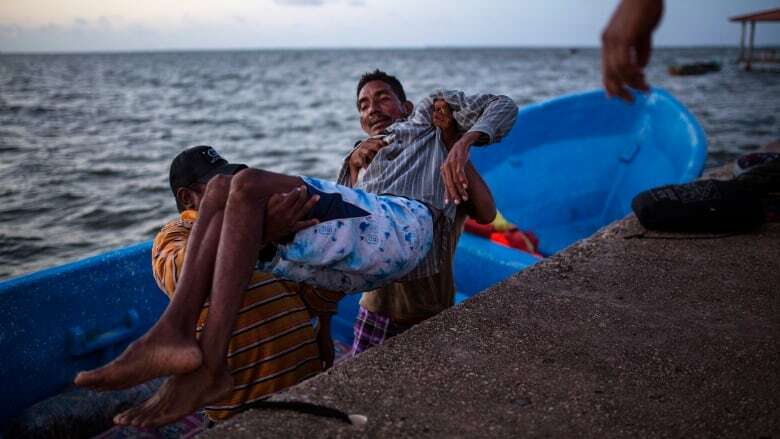 A study more than a decade ago cited by the Pan American Health Organization reported there were around 9,000 divers in the Mosquitia, and around 4,200 — 47 per cent — were disabled by decompression sickness. Nearly all, it found, had suffered symptoms. A diver makes 75 lempiras ($4 Cdn) per pound of lobster and seven lempiras (38 cents) for each sea cucumber. An average 10 pound daily haul of lobster is a windfall in one of the most impoverished regions of the Americas, so many take the risk, and many suffer for it, like Atiliano, who dove for 25 years without a problem until that day in September. 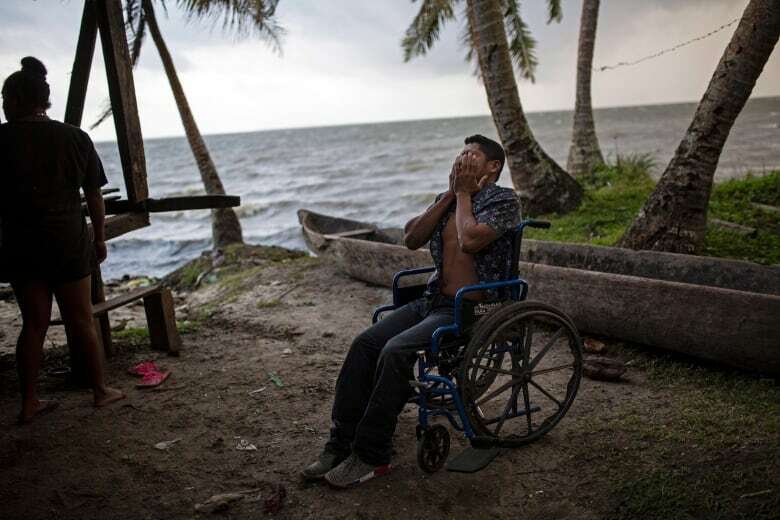 The father of 10 was paralyzed on the boat, which didn't reach the docks for another day and a half. 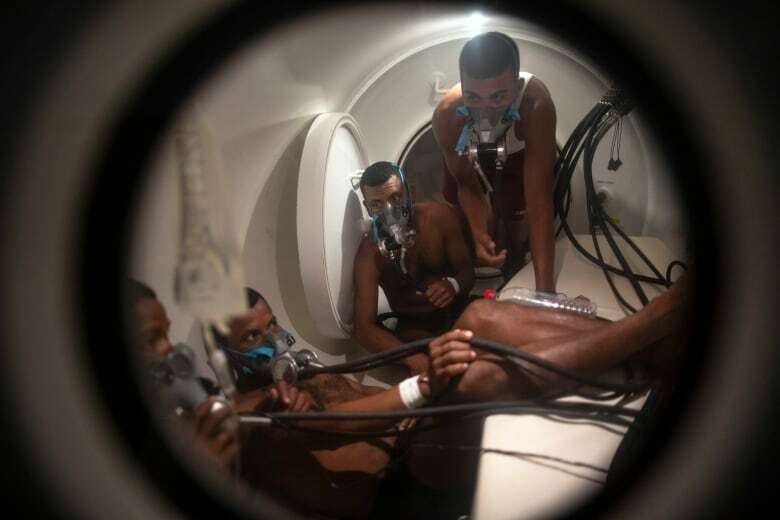 Fellow divers then drove him about 10 blocks to the hospital with a U.S.-donated hyperbaric chamber in city of Puerto Lempira, the area's largest city. "It's the first accident I've had," Atiliano said, speaking in Miskito through a translator. He appeared exhausted, with a blank stare, after a session of more than three hours in the chamber. He had shown little outward sign of improvement after that early treatment. Another patient at the chamber was Charles (Charly) Melendez, a 28-year-old Miskito who said he been diving since he was 16 and had harvested 60 pounds of lobster on the day in November 2017 that he was injured. Even now, after nine sessions, he hasn't recovered. For a man who always made his living diving, it's a nightmare being confined to a wheelchair. "I still can't stand up by myself," he said. "I can't sit for a long time; after an hour my body hurts." "You run into them in the street and ask them why they're going [back to diving], and they say it's because their kids are hungry," Waldan Mendoza said. Atiliano and Melendez are among the most vulnerable cogs in the lobster industry, which generated $52 million in sales for Honduras in 2017, nearly all of it from the U.S. market. "If I recover, by necessity and for lack of work I'll have to go back to diving," he said.